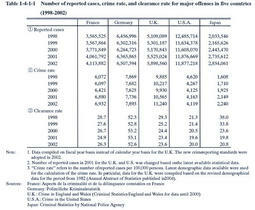 Table 1-4-1-1 shows the number of reported cases,crime rate,and clearance rate for major offenses in the five countries from1998to2002(see Appendix1-13 and 1-15 ). Though the number of reported cases and crime rate for major offenses in Japan are remarkably lower than those in other countries,they showed more significant increase than other countries.Reported cases rose in all countries from2001in2002. Clearance rate in countries except Germany had showed a slightly downward but increased in2002.